Landscape designers working on a plan for the Riverside Maritime Trail Park, a 14-acre swath of public land across the Peconic River from downtown Riverhead, are expected to present their final plan to the Southampton Town Board in December. The property meanders alongside the river from just east of the Riverside McDonalds, passing by three coves and moving through phases of successional and mature woodlands, an undulating shoreline that is a haven for wildlife. Landscape architects Araiys Design of Southampton will present their final plan at the town board’s Dec. 13 work session, which begins at town hall at 10 a.m. It’s the product of a $50,000 Environmental Justice grant from the New York State Department of Environmental Conservation awarded to the Flanders, Riverside & Northampton Community Association for the design of the park. The design project was 90 percent complete in mid-November, when Araiys Design laid out the community priorities for the property, and its plan for controlling invasive phragmites, tall reeds that grow along the banks of the Peconic River. At earlier community meetings, residents said walking trails, a boardwalk, rest stations, a kayak launch area and bike paths topped their desires for the property. 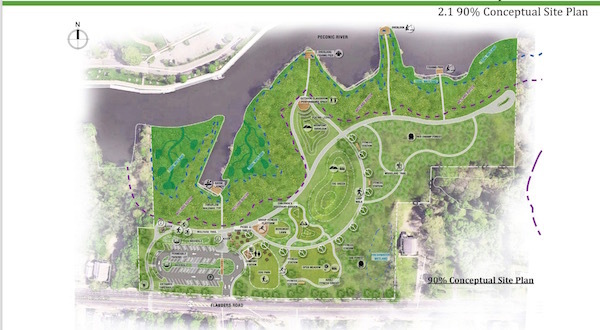 They also were interested in making the park accessible to wheelchairs and people with cognitive, visual or hearing impairments; safety; art displays; children’s trails; a fishing platform and a habitat garden. The 90 percent conceptual site plan for the property includes a parking area across Flanders Road from Vail Avenue, with a kayak launch on the cove directly behind the parking area. A multi-use trail would run east to west through the property, following the curves of the river, with side trails through meadows and woodlands. There would be a comfort station near the parking lot, and, not far from the entrance, an outdoor amphitheater, a fitness circuit trail, a dog park, a group fitness platform and a children’s discovery garden. Three overlooks and fishing piers are built into the design alongside the undulating coastline. The property includes significant areas of tidal wetlands, which would need to be managed to remove phragmites and keep them from overcrowding native shoreline plants. The restoration plan for areas overrun by phragmites includes creating tidal channels to help transport water into the back marsh areas, which would increase the salinity of back marsh waters, creating an environment that is more conducive to native Spartina beach grass than to phragmites, along with annual cutting of phragmites. Along the river’s edge, Araiys Design recommends cutting and excavating the root zone of phragmites, removing their rhisomes, bringing in clean fill and replanting with native species. They also recommend using Coir Logs, a coconut-based biodegradable structure that can be planted with native species, to stabilize eroding sections of the shoreline. The plan also includes elevated ThruFlow walkways, which allow sunlight to penetrate through to the marsh grasses, en route to the overlooks. Design documents are available to the public online here.